Warm Greetings from Rev. K. Chaitanya Kumar Unity India to you all in the Highest Name of our Lord Jesus Christ who shed His precious blood on the Calvary Cross for our sake, who is coming, KING and blessed Saviour. Let we greet you and thank you for your gracious hearts and Partnership with you to do the wonders in this wonderful CFD Ministries, India. Let His will only be done. We need it and we have to work more and more to win the Souls with your kind support and lovely partnership. WE are all ever grateful to you for your tireless,awesome, outstanding and amazing work you are doing for India, and for our needy Target groups. Thanks a lot for your prayers for our safety and security too as well as our needs to be met in Jesus Name. Amen!! We love you and love you and love you till the end of our lives until we meet in Heaven. Amen!! 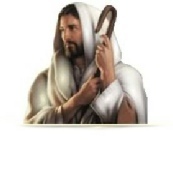 You are our boons and gifts given by our Lord Jesus Christ. 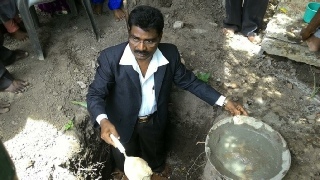 We went for a rural area to attend and did the Lord's Work for the Ground breaking Service recently in our rural Areas. 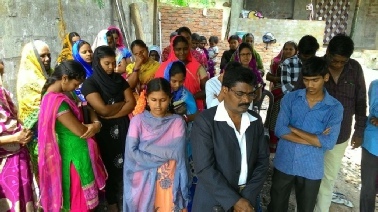 Please pray that Lord will supply the material to construct the Church where all the people are gentiles and Hindus, who have a rock hearts but Lord called our men/woman to do Pastoral work from the same community to bring them to the feet of Jesus Christ to save the dying souls for His Glory. 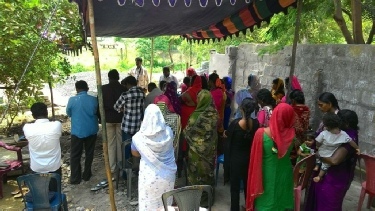 WE are praying and planning to construct 3 Churches, 1.Gunnampalli , 2.Undeswarapuram both are among Caste Hindus known as Upper Caste / Community and the third one is among Lower Community in Chidipi Village,where foundation already laid few years ago. We need materials to construct these Three Churches. We need Cement, Sand, Iron and Bricks as well as labourers to do the Construction Work. We will need $1000 for the material to start the Construction for each Church . Let our Lord supply all our needs as we have Faith in Him. Amen! Please pray and do it needful How the Holy Spirit and Lord directs you in the regard to our needs continuously. Lord willing any one come forward to meet/ Sponsor the construction cost, we will Name the Church as he/she suggests to give the Glory to God. Amen! Please also pray for our dire need to feed of the Lepers, Widows, and for Bibles as well. Please understand our burdens in this part of the world. We are happy to send you the pictures of CFD Ministries India Foundational / ground breaking Service photos for your kind information and prayers. Gartered in the Tent for ground Breaking service for the Village Church. Gathered for the Service from every part of the Village. 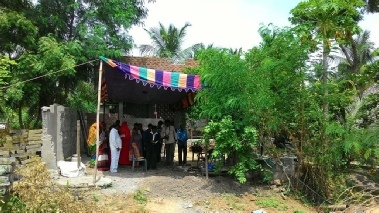 All are Praying for the Service to shower the Blessing of God on the Ground and for the Church to be constructed. Rev. 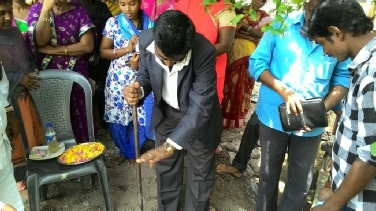 Kumar prayerfully breaking the ground for the Construction of the Village Church. Dug a pit in the Corner of the Proposed Church Ground. Rev. 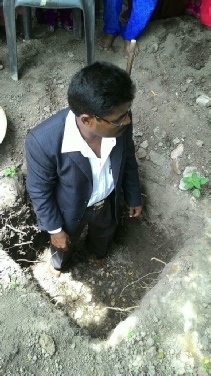 Kumar stood in the pit ready fill with construction material for the Cornerstone. Rev. 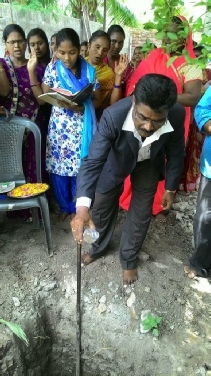 Kumar prayerfully starting the Construction by filling with Cement and broken brick in the ground, the Cornerstone of the Church. Final Prayer and Benediction of the Ground breaking Service in Village. May God bless you all richly and abundantly and also use you for His Glory as a living witness. Amen! Yours ​spiritual Son & Brother and​ His bond servant in Jesus Christ. 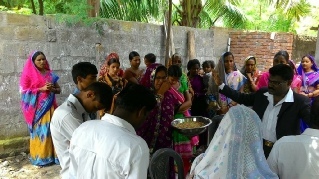 "Winning Disciples in India for the Lord Jesus Christ"